Updated: Hunter has been adopted into his forever home, including several furry family members! I'm called Hunter, and I'm searching for my forever home. 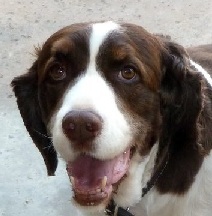 Hunter is a senior English Springer Spaniel, but you'd never know it to look at him! Playful, and energetic, he has a very loving personality with people. He weighs 57 pounds. Hunter must be an only dog. He is house-trained, neutered, and microchipped. Good on a leash and great in the car. Oh... I... can't... resist... wanting... this... DOG! Just a heads up that I understand that Hunter is still looking for his forever home.